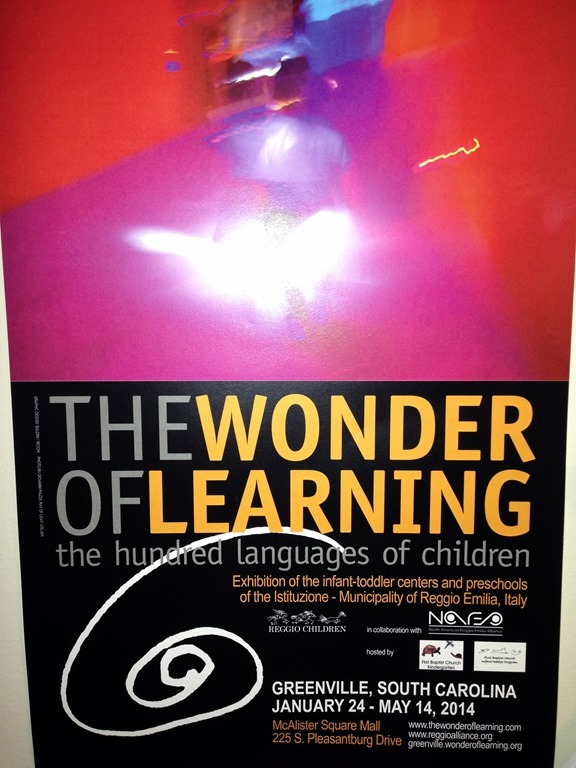 If you are in the Greenville, SC area and you have an interest in young children, how they learn, and creating environments for fostering curiosity and wonder, you need to see The Wonder of Learning: The Hundred Languages of Children exhibit at McAlister Square. 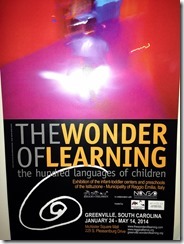 This traveling exhibit from Reggio Emilia, Italy will be in Greenville until mid-May 2014. I had the opportunity to take my staff to see the exhibit about a week ago and it gave us a lot to think about as we reflected. At my school we use a curriculum model called The Project Approach, which is similar in philosophy to the schools of Reggio Emilia. The focus is on the process of learning, initiated by the children’s interests and questions. 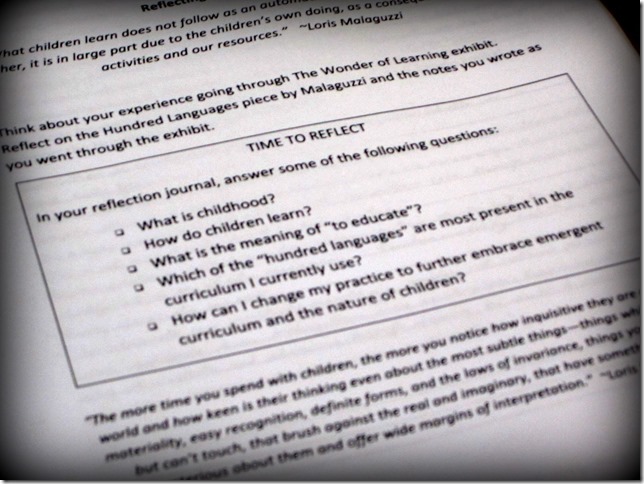 We thought about some guiding questions (some from Working in the Reggio Way by Julianne Wurm) as we experienced the exhibit for a couple of hours. What is the meaning of “to educate”? Which of the “hundred languages” are most present in my practice? I was struck immediately by the attitude of respect for children and their learning that permeated the exhibit. 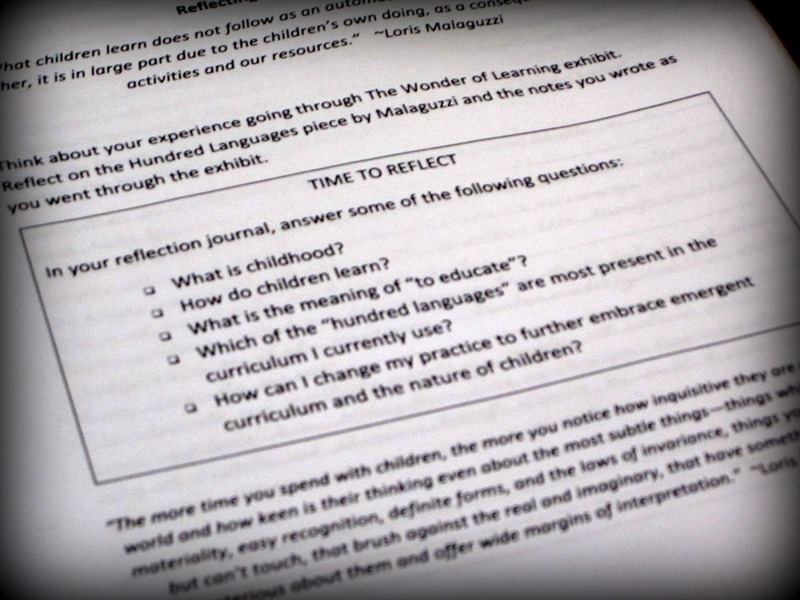 Every bit of documentation exuded value…value for how children think, value for the processes they go through to figure out the world around them, value for their words and expressions, value for their environment and how they spend their time. The projects highlighted in the exhibit showed children who were valued by teachers, the community, the parents, and each other. The cultural context is important to consider when viewing the exhibit, as the value on early childhood education is high in the community of Reggio Emilia. Documentation of the children’s projects are displayed around the city, public spaces are used by the children for study and play, community members assist in project work and families are instrumental in encouraging their children’s learning. I spent a long time looking at a book the children wrote as a visitor’s guide to the city of Reggio Emilia. In our culture of Common Core and higher and higher expectations at younger and younger ages, I worry about how we are defining “education”. As I moved throughout the exhibit, I thought about what it means “to educate” a child. The definition is always changing in my mind. I used to think that I needed to focus only on skills and concrete results in the form of achieved standards that can be checked off on a list. Educating is so much more than that, and sometimes not that at all. It is providing opportunities for children to feel valued as they explore, ask questions, interact with other children and adults, and experience competence at their own level and in their own time. Children need opportunities to see people working together and other adults valuing their experiences and perspectives. They need freedom to explore in an environment that allows for joy in the most ordinary materials or events in the day. In one section of the exhibit I saw a project on napkins. The ways children manipulated and created using napkins was amazing. These children were making observations about napkin texture and strength, using expressive and rich vocabulary, exhibiting imaginative thought, and experimenting with space, structure, and form. The ordinary became extraordinary. I hope to see it and learn how to be a better Zuzu (grandmother.) Thanks for the post, Meredith.